Just last week, Google released their third quarter earnings. With almost $10 Billion in revenue for the quarter, the search giant continues to show strong and consistent top line growth. In their earnings report, Google noted a 5% increase in the average cost per click (CPC) on a year over year (YOY) basis. 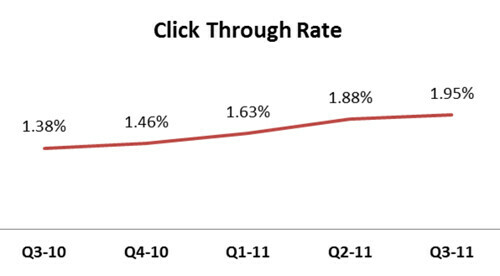 In contrast, the typical Marin user running a Google paid search campaign during this time saw an 18% decline in CPC, coupled with higher click through rates (CTR). 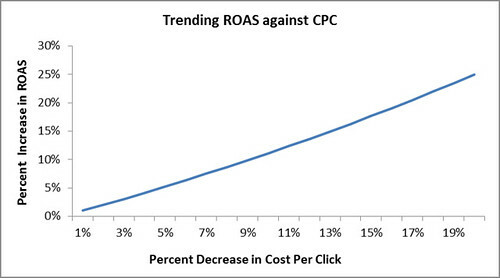 This combination of decreasing CPCs and increasing CTR resulted in a higher return on ad spend (ROAS) for Marin users. Assuming no changes in other factors, the following chart shows how reducing the CPC leads to a direct increase in the ROAS. As ROAS is also affected by ad position and Quality Score, we normalized for the influence of these two factors by looking at CTR trends. The chart below shows how CTR actually increased across our user base during this time, implying that Quality Score and ad position did not have an adverse impact on ROAS. While this trend doesn’t apply to every client, our data suggests that the average Marin user may have outperformed the average AdWords user. So, how did this happen? 1) Improved Keyword Matching – Marin users leveraged match types more effectively. More clicks were observed coming from exact and phrase match terms, which led to higher CTRs and lower average CPCs. 2) Bidding Efficiencies – Marin’s bidding algorithm automates keyword bids based on user defined business goals (such as ROAS), leading to more efficient capital allocation across the keyword portfolio. 3) Cross-Channel Visibility – Many conversions happen offline or in a call center. Because Marin incorporates conversion data from online and offline channels, users have complete visibility into their paid search performance and can make smarter, informed decisions about where and how they spend precious ad dollars. Download the complete quarterly report behind this blog post and learn about the latest trends across verticals, devices and search engines.